Earth is overrun with an apocalyptic plague. The infected wander the streets in undead hordes, feeding on live flesh while spreading their infection. Welcome to the dystopian world of Marvel Zombies, a dismal reality where Earth's heroes undergo an undead transformation. Our zombiefied hits collected here, all for your spine-tingling pleasure! The first appearance of Marvel's Zombie Universe! Ultimate Reed Richards discovers the Zombieverse while exploring dimensions. Witness the living FF come face-to-face with their undead counterparts in Crossover, the multiversal story arc by Mark Millar! It all begins here! The origin of Marvel's Zombie Universe is revealed in Dead Days, the prequel to Marvel Zombies #1. Who was first infected? And when the first hero fell to the Zombie Plague, how did the world react? 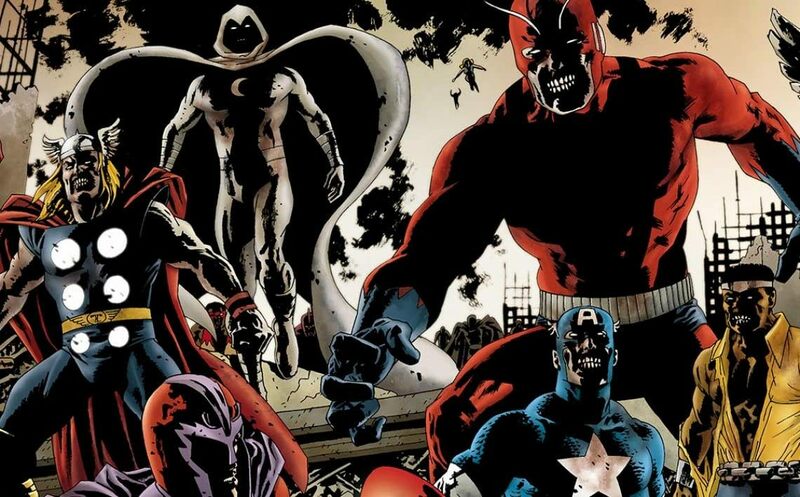 Magneto stands alone against the freshly-undead Avengers. Villain becomes antihero, as the former mutant menace takes a stand for humanity. The Silver Surfer arrives in all his cosmic glory. Zombies in space! The second volume of Zombies kicks off 40 years after the first plague. The planet has been devastated by the insatiable hunger of those infected. The Zombie Avengers seek sustenance outside of Earth, devouring extraterrestrial beings and mighty Galactus himself. Who will be the the next victim of Earth's Decomposing Heroes? Featuring Ego the Living Planet. Mankind's battle against the undead continues, and desperate measures are required. Michael Morbius leads the initiative in finding a cure that will restore zombies' humanity. Robots Machine Man and Jocasta are impervious to zombies, making them ideal candidates to find this retro-virus...in the frontlines of Zombieverse! It's a truly gruesome reality, as Marvel's zombies face the Legion of Monsters! Morbius, Satanna, Hellstorm, Man-Thing, and Werewolf by Night; where humanity has failed, these monsters shall succeed- or die trying. Writer Fred Van Lente provides the ultimate bloodbath in the fourth volume of Marvel Zombies! Spaghetti Western meets ghoulish horror in the first issue of Marvel Zombies 5. Machine Man continues his search for a cure across the Zombieverse. But before he arrives in the Wild Ole' West, outlaws Phantom Rider and Two-Gun Kid arise from the grave! Get ready for long stares, saloon brawls, and plenty rottin' flesh. A spook filled Halloween special! In the not too distant future, X-woman Kitty Pryde lives with her son Peter, barricaded against zombie hordes. On Halloween night, the emergence of Mephisto threatens all they hold dear. It's a night of undead horror, as a young boy discovers the meaning of Trick or Treat! In an alternate Zombieverse, undead Nazis reign supreme. Destroy! serves up a blast to the Golden Age past, as Dum Dum Dugan and his team of inter-species heroes battle Third Reich zombies! History and sci-fi collide in this offbeat read. Guest-starring Howard the Duck. Earth-S' heroes get an undead makeover! Squadron Supreme members lose their humanity at the hands of a mad geneticist. On Earth-S the cure to mortality...is zombification! A true gorefest of a series, complete with gristle, bones, and guts. Fan-favorite mini-series by Cullen Bunn! Deadpool awakens to a Zombie Apocalypse after a longer than average nap. Will the Merc with a Mouth be able to keep his flesh in the midst of desperate zombies? Artist Ramon Rosanas delivers a black and white throwback to horror flicks of yesteryear!